Notre Dame-West Haven’s Zach Laput, left, and Wilbur Cross’ Enasj Jones get tangled up underneath the basket during the first quarter Friday. 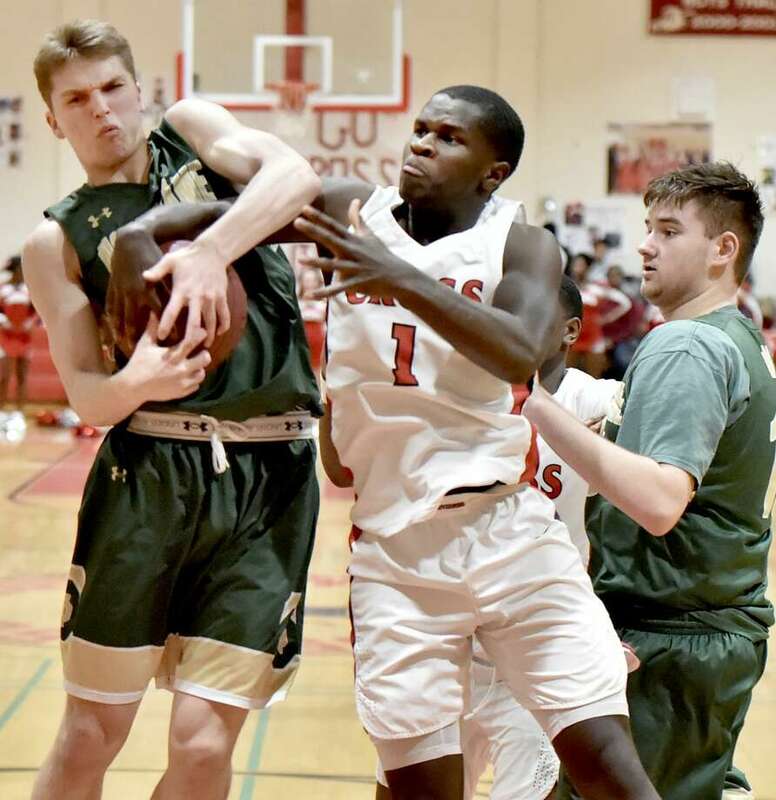 When all was said and done, including a brief sideline skirmish and another on the court, Wilbur Cross handed the Green Knights their first defeat of the year with a 65-60 Southern Connecticut Conference victory on Senior Night at Wilbur Cross. For the Governors (13-7), the victory could be a momentum builder going into the postseason. For the Green Knights (19-1), the loss may be an after-thought as their go-to player, Connor Raines left the game for good with an apparent elbow injury with 1:20 remaining in regulation. The intensity of the game was present from the start as the Governors overcame an early four-point deficit to take an eight-point lead after one quarter. With neither team happy with the officiating and the play getting physical, tempers finally flared with 2 minutes, 52 seconds left in the third quarter as heated exchanges between both sides escalated by the Notre Dame bench. After order was restored and a police presence was in effect by both benches, play resumed with the Green Knights seemingly fired up by the extra activities. Trailing by nine points at the time, the Green Knights, ranked third in the GameTimeCT/Register Top 10 poll, eventually went down by 14 points when Kyle Daniels drained a shot for a 48-34 Cross lead to start the fourth quarter. Notre Dame then picked up its intensity. With both teams now fully engaged in the intense play, tempers finally erupted with 14 seconds remaining in overtime. As the seconds ticked away and with Cross up by three, pushing and shoving on the court led to fans and players joining in before order was restored. When all was said and done, one player, Notre Dame’s Bangaly Cherif, was ejected, and the scene became a dramatic one. Cherif will now be forced to sit in Notre Dame’s quarterfinal match of the SCC tournament next Saturday. Aside from all the extracurricular activities what will be overshadowed is the great game plan Cross had to hand Notre Dame its first loss of the season. Not only did the Governors use their quickness and defense, but they made life difficult for Raines (17 points), Zach Laput (9 points) and Jaiden Kimbro (15 points). Trailing by 14, Notre Dame ended regulation on a 22-8 run, including a bucket by Raines in the final seconds to even the game at 56. Cross jumped out in front to start overtime on a bucket by Terrance Edwards and never looked back. The Governors added a bucket by Daniels and a free throw by Edwards for a 61-56 advantage. Notre Dame got within 62-60 with 25 seconds to go on a pair of free throws by Laput, but Cross hit three of six free throws down the stretch to seal the win. Daniels finished with 17 points, while Enasj Jones and Edwards each had 10 for the Governors.